Note: It’s not uncommon for one or more of the worker bee attendants to have died. WARNING!! Avoid keeping in any room where pesticides are used, especially “NO PEST STRIPS”. Also avoid leaving in sunshine. Keep at 65-80 degrees in a dark place away from drafts. Place one drop of water on the screen away from the candy side as soon as the queens arrive. The queen(s) that you have received are in a combination shipping and introduction cage. There is no need to remove the worker bee attendants or cork. This cage provides food (white sugar candy) during shipment which also acts as a “timed release” barrier for your hive bees to eat through, allowing several days pheromone adjustment. The hive to receive the queen must have no queen or queen cells already present. 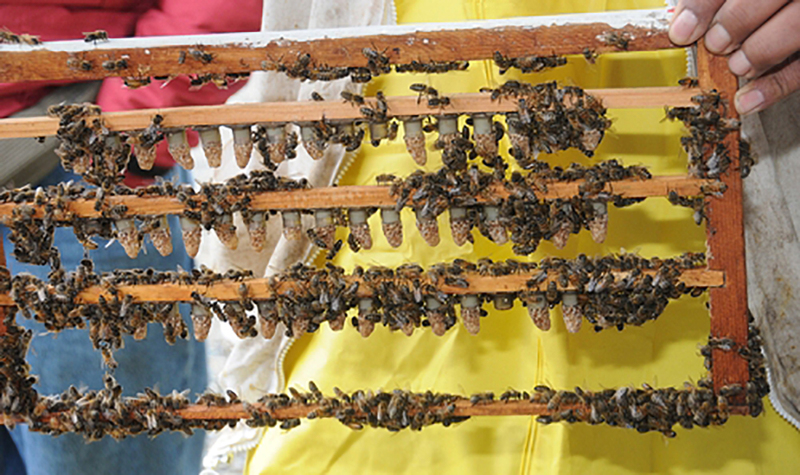 Ideally, the hive should be queenless for at least 24 hours prior to introduction. The cage should be placed in the middle of the brood nest (if no brood is present, place in the middle of the cluster). Position the cage between two frames, so that the candy end points up and the screen is not blocked. Squeeze the frames around the cage to firmly suspend it, any damage to the comb will be repaired by the bees when the cage is removed. Make sure the hole at the candy end is not blocked. Note: If 10 frames are used, one frame may have to be removed to accommodate the cage. The bees in your colony will chew through the candy and release the queen within a few days. The colony should be disturbed as little as possible for the next two weeks while the queen establishes her brood nest. Queen Be To Be. Kathy Keatly Garvey. (2011, March 28). Retrieved February 8, 2017 from Bug Squad.